Recent acquisition: Sébastien Saulnier, Notice sur le voyage de M. Lelorrain, en Égypte; et Observations sur le zodiac circulaire de Denderah (Paris, chez lʼauteur, 1822). So begins chapter 1 of the riveting account by Jed Z. Buchwald and Diane Greco Josefowicz, The Zodiac of Paris: How an Improbable Controversy over an Ancient Egyptian Artifact Provoked a Modern Debate between Religion and Science (Princeton: Princeton University Press, 2010). In 1820, Sébastien-Louis Saulnier (1790-1835) commissioned the master mason Jean-Baptiste Lelorrain to travel to Alexandria, detach the large stone zodiac from its place within the ceiling of the Temple of Dendera, and smuggle the artifact back to France. Lelorrain set out to purloin the stone-carved, bas-relief ceiling of the Temple of Dendera, almost out from under the very noses of Egyptian officials and their favored English antiquities collectors. Against long odds, Lelorrain returned in triumph. Saulnier was an antiquities entrepreneur and past editor of Bibliothèque historique (14 vols) and the journal Minerve française. To promote the arrival of this astonishing artifact to Paris, Saulnier published a book hailing the ceiling as equal in importance to the Rosetta Stone (proudly possessed by the British Museum), and therefore as a fitting symbol of the glory of France. Until it was bested by Heinrich Schliemannʼs excavation and ransacking of Troy in the 1870s, the snatching of the ceiling, or Dendera Affair, was Europeʼs most glamorous and notorious archaeological event. The Collections’ copy of Saulnier (1822), inscribed by the author, includes a large folding plate of the zodiac ceiling. This is the only North American copy we know of that is bound with an engraved plate of the artifact — which, as stated by a notice on the verso of the half-title page, could be separately purchased for 5 francs. The plate offers a detailed rendering of the zodiac, including the carved statues that encircled it, its band of hieroglyphics, and the dozens of astronomical and astrological symbols carved into its face. The plate was drawn by Vivant Denon , one of the artists on Napoleon’s Egyptian expedition . A cartouche at the base of the illustration names the first observer of the zodiac as General Louis Desaix (1768-1800), the Napoleonic general who first expressed an interest in removing the ceiling to France. Perhaps resentful of the British capture of the Rosetta Stone in 1801, Saulnier, a police commissioner and prefect during Napoleonʼs regime, became an energetic amateur student of Egyptian antiquity. Although his expertise was middling and his methods of acquisition were frowned upon by professional savants, his activities were encouraged by the government. And Saulnier was successful: not only did Lelorrain deliver the coveted zodiac to Paris, but Louis XVIII paid 150,000 francs for it. Saulnier also provides a detailed description of the zodiac itself. His attempt to identify its date, and the astronomical and mythological significance of its figures, is couched in a discussion of works by Charles Dupuis and the Italian antiquarian Ennio Visconti, among others who wrote specifically on the zodiac, as well as scholars such as the astronomer Jerome Lalande. The exact date and astronomical importance of the zodiac were hotly debated by French scholars for many years. The Zodiac was exhibited at the Bibliotheque Nationale in Paris until it was moved to the Louvre in 1964, where it remains on display. 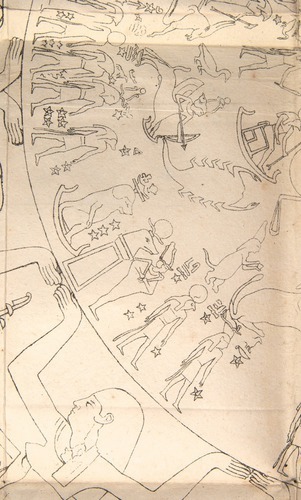 View Saulnier, Notice (1822) and the zodiac fold-out plate.